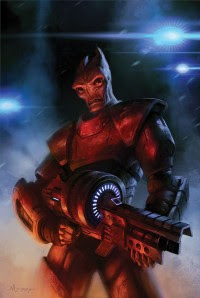 Next -- although actually shipping a week or so before -- is the second issue of Mass Effect: Redemption. The proper preview details are at the Dark Horse site, but I have also finally gotten around to getting a parent page for the series online here. This issue, at least as far as I understand the release schedule, should be the first one out after the release of the video game sequel -- but don't take my word for that. Definitely check with your local retailer! 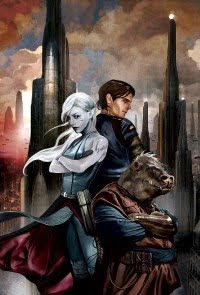 Just saw the new Star Wars: Insider -- we have a nice interview there about the end of the Knights series. Be sure to pick it up. And, finally, since you asked, yes, that is a very nice new interview with Dark Horse's Randy Stradley here at TheForce.net -- and yes, he's exactly right that "fellow editor Dave Marshall and writer John Jackson Miller don’t want me to spill the beans about the new series they’re working on." Ladies and gentlemen, start your speculating! Hmmm. I'm visiting my mom today -- on a day when the word for the day is mum. Coincidence -- or part of a great master plan? Bwa-ha-ha! The beginning of the end begins Nov. 18!